If the digital camera had been invented in the 1950s, it would probably have looked a lot like the Canon PowerShot E1. The curvy design brings to mind a host of associations ranging from vintage jukeboxes to early refrigerators. This isn't necessarily a bad thing, as retro is still 'in', but unfortunately the spell lasts only as long as you don't take the camera in your hands. Pros and photography snobs have long been referring to plastic compacts as 'soap boxes', but no camera has got as close to this as the PowerShot E1. Virtually everyone I showed it to commented on the strong resemblance. Many of the earlier PowerShot models were also plastic cameras, but they still retained a quality feel, which is, unfortunately, completely missing from the E1. It almost seems as though Canon had deliberately instructed their procurement team to dig up the lowest-grade plastics they could locate to cut costs, and the result is not pretty. The company's press release claims that the E1 was "designed by women for women", but our impression was that it was more likely to have been designed for children. The dimensions are compact, making the E1 one of the smallest members of the PowerShot family. The familiar right-hand grip has given way to a rounded bulge that still fulfills its function, although the slippery finish makes it less secure to hold. The moderate size of the camera and the well-thought-out placement of the controls make one-handed operation problem-free in most situations. The front of the camera is dominated by the protruding 4x zoom lens, which boasts optical image stabilisation. The zoom is motorised and spans�focal lengths ranging from 35mm to 140mm in 35mm equivalence. Unlike some of the more versatile PowerShot models, the E1 does not support the use of conversion lenses. The camera sports an on-board flash but no hot-shoe, so the only way to sync up an external flashgun with it is to optically slave it to the built-in unit. Canon themselves recommend the separately sold HF-DC1, which comes complete with a small flash bracket but can also be hand-held or mounted on a light stand. Just like the other PowerShots, the E1 is powered by a pair of AA sized batteries that can be loaded via an opening in the bottom plate. The compartment door can be hard to open and even harder to close, but it is not advisable to force it because, just like most other parts of the body, it is made of very low-quality materials and may break easily. 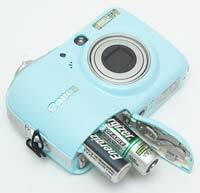 Once the cover is open, there is nothing to hold the batteries in place, so they can fall out if you hold the camera the wrong way. The same compartment houses the memory card slot, which accepts SD, SDHC, MMC, MMCplus and HC MMCplus cards. The control layout will be familiar to anyone who has ever used an A series PowerShot before, with some minor changes. The top plate features an on/off button, a mode dial and the shutter release surrounded by the zoom lever. The back panel has a Playback button that replaces the slider which fulfilled the same function on earlier cameras, a new Face Detect toggle button, the familiar customisable Direct Print button, four-way pad, FUNC/SET, DISP and MENU buttons, all located right of the LCD. Speaking of the LCD screen, it is a fairly big one that measures 2.5 inches diagonally, but it lacks the resolution needed for a screen of this size, sporting only 115,000 red, green and blue dots in total. Fortunately the camera also has an optical viewfinder whose angle of view changes as you zoom in or out. While this is a very, very small finder that gives a tunnel-like vision and naturally also suffers from parallax error, it does allow you to at least approximately frame your shots when the LCD is hard to see, plus its use also contributes toward saving power, should this become crucial. There are 17 shooting modes available on the PowerShot E1, though none of these allows the user to set the aperture or shutter speed manually. The Easy mode, labeled with a heart, provides no user control over anything except zooming and a couple of flash modes. Most of the controls are disabled. In Auto mode, you can specify the pixel count and the quality level and gain access to a number of settings that are unavailable in the Easy mode. Furthermore, there are 13 pre-programmed Scene Modes available on the camera, five of which � Portrait, Landscape, Night Snapshot, Kids&Pets and Indoor � have their separate pictographs on the mode dial, while an additional eight are available under the SCN setting. These are useful if the user wants� to inform the camera about what type of subject it is supposed to take a photo of, thereby increasing the chance that focus, exposure, white balance, depth of field etc. are optimised for that particular subject. In addition, they provide some extra control options for the person behind the camera, most notably exposure compensation. The camera also has a P mode, which gives the user the most control over how their photographs are made. The extra options include a choice of preset white balance settings, a custom WB option � which can be mapped unto the Direct Print button if desired, via the shooting menu �, access to individual sensitivity settings from ISO 80 to ISO 1600 and some truly advanced features such as centre-weighted and spot metering, AE Lock � activated and deactivated by pushing the ISO button while holding the shutter release depressed halfway �, Flash Exposure Lock � activated the same way when the flash is set to Forced On � plus a feature called My Colours, which lets you choose from Vivid, Neutral, Sepia and B/W or set the contrast, sharpness and saturation separately. Finally, this is the only mode in which you can enable the camera to use shutter speeds slower than one second for long exposures. There is a rather counter-intuitive way to do this: retrieve the control panel by hitting FUNC/SET, and while Exposure Compensation is highlighted, press the DISP button once to choose from a range of shutter speeds between 1 and 15 seconds using the navigation pad. Finally, the PowerShot E1 also allows you to record movie clips. There are two main movie modes, 'Compact' and 'Standard'. 'Compact' is optimised to be small enough for attaching to e-mails as it is a mere 160x120 pixels at 15fps. Both optical and digital zoom are disabled. 'Standard' can be set to one of three settings: 320x240 pixels at 30fps, 640x480 pixels at 30fps and a "Long-Play" version of the latter, which allows double recording time per unit of memory used.� The optical zoom cannot be used while filming, but the lens can be preset to any available zoom setting beforehand, and digital zoom may be used in the 'Standard' modes, if enabled. By default, exposure changes automatically during recording as seen fit by the camera, but it can be locked by pushing the ISO button. Exposure compensation for movies is also enabled this way. Most of the settings available in the shooting modes are accessed via a control panel, named the 'Function Menu' by Canon and activated by pressing the FUNC/SET button in the middle of the navigation pad. This is a straightforward and fairly quick way of making adjustments, once you get used to it. Certain oft-needed functions have dedicated buttons. These include ISO, Flash Mode, Drive Mode and AF range, accessed via the Up, Right, Down and Left buttons on the four-way pad, respectively. The first three are self-explanatory, while AF range, called 'Shooting Zone' by Canon and denoted by a flower icon, can be set to Normal, Macro or, in certain shooting modes, Infinity as well. The latter is a very useful addition, as it makes the camera more responsive by saving the time needed to focus, and still allows everything between a few metres and infinity to be sharp, at least when shooting at the wide end. Finally, a number of settings are buried in the main shooting menu. Notable examples are AF mode � called AF Frame by Canon �, display overlay, IS mode and the mapping of functions unto the Direct Print button. The auto-focus mode can be AiAF, Centre Spot or Face Detect. In AiAF mode, the camera decides what to focus on, and since it has no way of determining what is important for the photographer, this mode is better avoided. Centre Spot AF uses a single AF point in the middle of the frame and, together with a half-press of the shutter release, allows the use of the good old focus-recompose technique. Face Detect AF can be used to good effect when photographing people facing the camera, provided the LCD is not turned off. If Face Detect AF is used in conjunction with evaluative metering and AWB, the camera also optimises exposure and white balance for the faces. Importantly, the E1 has a dedicated toggle button for Face Detection, so you do not necessarily have to enter the menu to activate it. Display overlay is a useful function � you may have Rule of Thirds gridlines, 3:2 aspect ratio crop lines or both displayed on the screen while composing. The latter won't actually crop the image, but will show you where it will be trimmed when printing directly on photographic papers with a 3:2 aspect ratio. Sadly, the overlay options do not include a live histogram. IS mode can be set to Continuous, Shoot Only, Panning or Off. Continuous will stabilise the live image on the LCD � though not in the viewfinder � as well as the shot itself. Shoot Only will only kick in when the shutter button is fully pressed, saving you power. In Panning mode, only vertical vibrations are countered by the IS mechanism. Turning the stabilisation off is recommended when mounting the camera on a tripod. Finally, the last notable action you can take in the shooting menu is registering one of eight functions to the Direct Print button, with Exposure Compensation and Custom White Balance being the most likely candidates. Besides the shooting menu, the E1 also offers a setup tab. This is where you set your preferences once, when first using the camera, and typically never change them again. 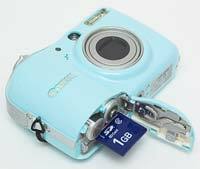 Two possible exceptions include the muting of all sounds, which some users will do once and for all, but others might only do this only temporarily, in places where silence is required; and formatting, which you will probably want to do each time you buy a new memory card for the camera. In Playback mode, you are presented with two other menus, Playback and Print. The range of options is fairly limited, with post-capture red-eye reduction, resizing and recording sound memos being the most important on the Playback tab. In use, the Canon PowerShot E1 proved to be quite responsive for an entry-level compact digital camera, with only the flash recycle time being really problematic. I did miss direct access to aperture and shutter speed, but the intended target consumer might not find this limitation to be of major importance. The inclusion of an exposure compensation function was nice, although it would have made more sense if a live histogram was also provided. Most other settings were adequately easy to change, similar to the PowerShot A series models. The poor build quality was, however, a source of constant concern, as I was worried that the camera might be irreparably damaged on the slightest impact. PhotographyBLOG is a member of the DIWA organisation. Our test results for the Canon PowerShot E1 have been submitted to DIWA for comparison with test results for different samples of the same camera model supplied by other DIWA member sites.